When it comes to dating apps we kind of expect them to have a name similar to Tinder now. There's Grindr for the gay man and Bristlr for the man with a beard and the women who love beards. But now Tinder have decided that 3ndr, the dating app for curious couples looking for a third person, is infringing copyright by having a name too similar. 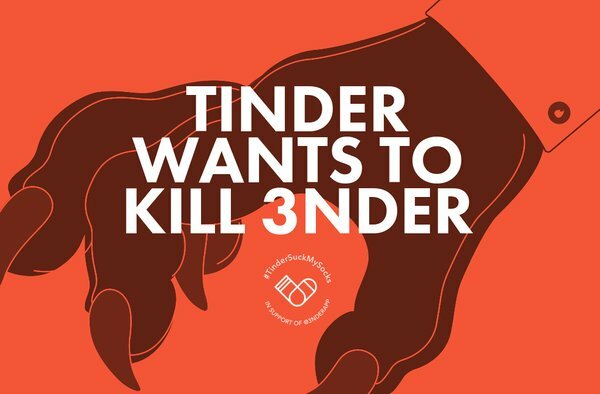 Tinder are claiming that 3nder, which is said like threen-der, sounds too similar to Tinder. In a letter they asked the company to cease operations or Tinder will sue them in London's high court. 3nder have argued that their name comes from the words three and friender put together because they aim to introduce three people to each other. It makes sense and they point out they aren't the only dating app with a similar name, but they are the only ones under threat of a lawsuit. 3nder have responded by pretty much ignoring the request, but are not letting this lawsuit go to waste. Not that many people are likely to have heard of 3nder and this is certainly getting them noticed. There probably should be more out there for people who want to introduce a third person into a relationship and this does seem like a good idea. So 3nder have created the hashtag #TinderSucksMySocks and would like users to post pictures of their dirty socks. It's supposed to suggest they're busy people, but it seems kind of weird to me. It's hard to say whether this is going to end well for 3nder or not, but they aren't giving up anytime soon. Even if there aren't many pictures of socks around, people are still showing their support and hopefully that will help.